Stock your pantry with items that lead to triumphant family style dinners…with the right ingredients, you can make old-Italian style gravy for pasta & so much more! Whether you keep your edible odds-and-ends in a cellar, basement, cupboards or pantry, the contents you shelve make all the difference in your family’s health. Now that summer is winding down, and your family’s schedule is about to get a lot more chaotic, you’re sitting pretty—ready to pose that much anticipated dinner invite to the grandkids and their weary parents. They’re ready to pounce on some creamy, yummy comfort rich dinners at Nana’s this season. 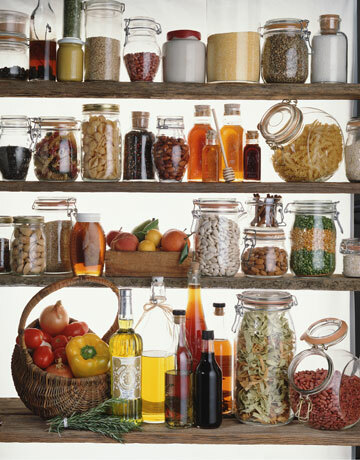 So, I ask you now: do you know what’s in your pantry? If the last mental snapshot you took of its inventory begins and ends with some withered old beans, dried apricots and canned perishables well past their expiration date, then it’s time to spread your culinary wings, my friend, and get busy stocking your pantry with pride. This is your chance to go hog wild, purchasing the most nutritious and versatile items available. Why? Because the right choices lead to “family style” dinners at your place, and I have the most delicious sauce to inspire the ultimate spaghetti meal with the whole fam: Get ready to dress up your spaghetti with my Rustic Bolognese Sauce for Pasta —you’re all set to make this and a whole lot more, once you get that pantry in top form; just consult my checklist at the very bottom of this post. But now…to advise on the actual shopping part. Where to go for these coveted staples? I recommend your favorite Superstore (mine just happens to be Target because I’ve found Archer Farms to be like the Garden of Eden) during an upcoming “tax free!” shopping week. Here’s a great tax free/back to school site that gives the where, when and what for lots of different states; though food is not included in the savings, it’s a chance to feel good about other purchases, i.e. treating your grandkids to a few school supplies and Circo label threads. Now, before I go and introduce my fool proof must haves for the ultimate healthy, sophisticated pantry, I should bring up just how important I think it is to make your pantry just as SMART as it is TASTY. This is one situation, you don’t wanna go for broke; you want the items chosen to stretch your food budget, inspiring you to take the extras from that successful dinner on Sunday night, by adding something from the pantry to recreate the dish into something entirely new for Monday’s lunch. This alpha ordered list may appear tidy, but my parting words to you—if you noticed—were “chili sauce.” It’s a dedication to my Fellow Nanas and hot tamales in the kitchen—write your comments and let me know what you made this month, and for as long as these staples last. Go now and set your family’s world on fire.